Workman Publishing Company, 9780761179887, 396pp. Pursuing a dream is hard work, but the right words delivered at the right time—by people who’ve been there and done that—can give us just the motivation we need. The right words can rekindle our enthusiasm, re-energize our efforts, dispel doubt, let us know we’re not alone, and show us that the fight is worth it—and winnable. 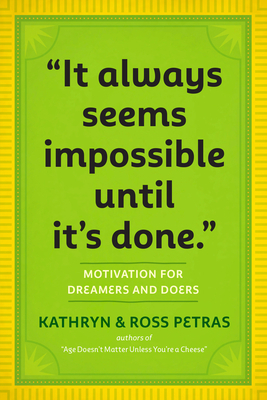 Kathryn and Ross Petras are masters at choosing and delivering just the right words. Their books—such as “Age Doesn’t Matter Unless You’re a Cheese” and “Dance First. Think Later.”—and bestselling calendar, The 365 Stupidest Things Ever Said, have over 5.2 million copies in print. Now comes a book for dreamers and doers, plus writers, entrepreneurs, graduates, artists, future movers and shakers. Collecting the hard-won, brilliantly expressed advice from pioneers who have paved the way, including everyone from Rumi to Steve Jobs, Michelangelo to Oprah to Tina Fey, “It Always Seems Impossible Until It’s Done” is like a rousing locker-room speech, inspiring courage, commitment, and perseverance.